Harlow, an expansive pub, garden bar and basement, is set to open in Richmond in mid-December. The new venue – designed by DC Group and Newline Design – will take over the former Great Britain Hotel, complete with a basement bar and dining area, courtyard, deck and intimate alcoves. The ground floor bar and dining area at Harlow opens into a 250pax split-level courtyard with timber decking, pergolas, festoon lighting and street art feature walls. There’s also a grungy basement bar, with neon signs, low booth seating, street art feature walls and a dimly lit metal mesh bottle display. Mark Proctor has come on board to the curate the fun cocktail list, which is inspired by the types of music set to the play within the venue. Broken down into three sections – hip hop, pop, and heavy metal – cocktails include ‘Boyz-N-The-Hood’, made with Jack Daniels, Apple Jack, Fireball and apple juice; ‘California Girls’ made with citrus vodka, peach liqueur, pinot gris, OJ and egg white; and ‘Voodoo People’, made white rum, spiced rum, orgeat and fruit juice. In the kitchen, Harlow has enlisted Telina Menzies as executive chef, who has designed a menu that nods to pub classics with a modern twist. Guests are encouraged to experience the food the same they would a gig, starting the feast off in style, with opener snacks such as duck and bacon sausage rolls, mini crab donuts and sticky Jack Daniels and Cola pork ribs appearing on the menu. For the support act, guests can tuck into a steak sanga, served with maple bacon and BBQ sauce, topped with Swiss cheese and salad before having headliners such as the snack pack kebab, the vegan burger or even the smoked beer and cheese dog grace the table. 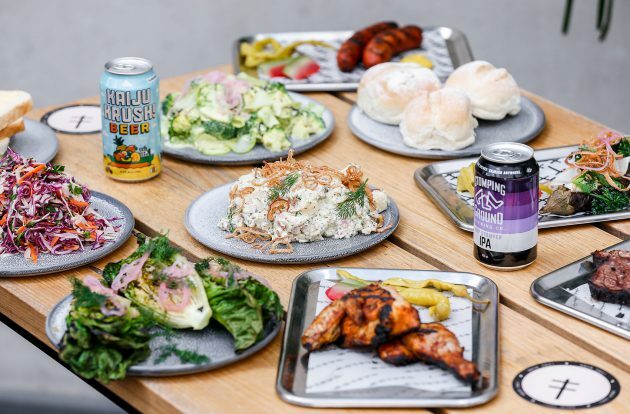 Large groups are encouraged to BBQ the Harlow way with a pre-paid BBQ, where the chef slings proteins on the grills to a backdrop of 80s and 90s bangers on the vinyls. “Harlow is an old-school pub with a new-school twist; the place you head to for a casual lunch and kick on into the evening, drinking flavour-packed cocktails and dancing to old music videos – or settle down on Sunday with the kids and the dog for a chilled afternoon”, says Menzies. “It’s fun, energetic and all about having a great time”. Harlow (447 Church St, Richmond) is set to open its doors in mid-December.